May 1937. 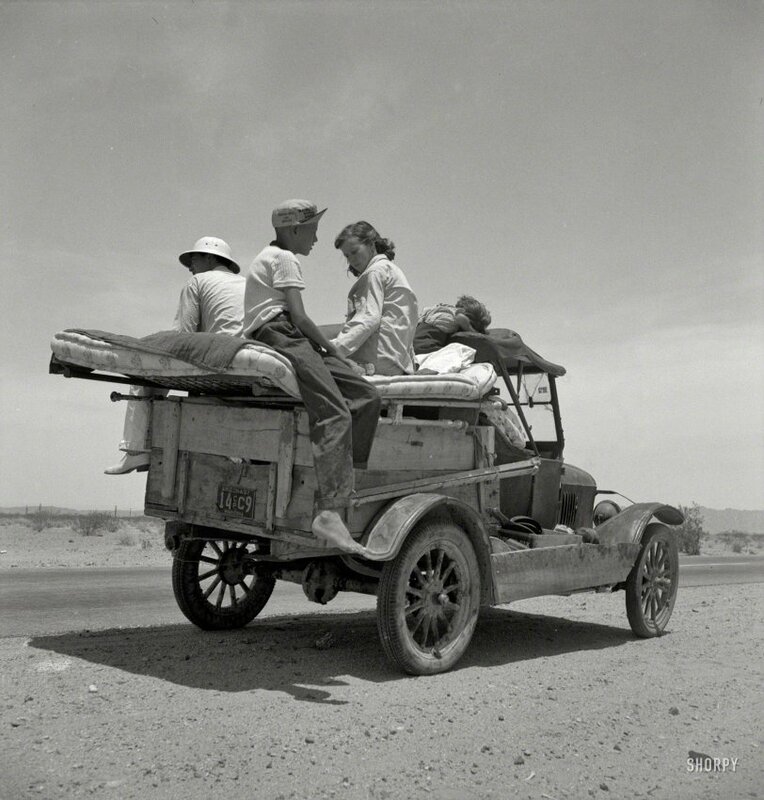 "Migratory family traveling across the desert in search of work in cotton at Roswell, New Mexico. U.S. Route 70, Arizona." Where are the cupholders on this rig? Dorothea Lange / Resettlement Administration photo. View full size. Submitted by Vintagetvs on Sat, 06/29/2013 - 6:46pm. No doubt, but I'll bet those kids told the story of their adventures to their kids, and their grandkids until they were sick of hearing it. Like a lot of things that seemed terrible at the time it probably becomes a bit more of a romantic adventure years down the road. Submitted by Lectrogeek68 on Sat, 06/29/2013 - 5:33pm. A quick look at the Google sat shows many center-pivot irrigation machines in the Roswell vicinity. I'd expect cotton there today. I was a little skeptical that there would have been cotton in the desert in 1937, but what do I know? There are enough people in that family that there is no way they could have all ridden in the cab of that pickup. It's a good thing the top speed of a Ford Model T is only about 40 mph. Even then, that mattress would have been a "thrill ride". Submitted by mountainrev on Sat, 06/29/2013 - 12:25pm. The Beverly Hillbillies, minus the laugh track. Probably very little laughter happening at this moment in this family's life. Submitted by stevendm on Sat, 06/29/2013 - 11:26am. I see eight of the old fashioned kind, if you include the 2 kids.